Although you might think that the rationale for choosing this album is the upcoming release of the Rapture’s third album, In The Grace of Your Love, I began to think about Echoes following an exchange with fellow site contributor, Fr. Jones. Specifically, we agreed that best part of the M83’s new single, “Midnight City,” is the saxophone outtro; “a ballsy, committed move,” according to Fr. To the best of my knowledge, the sax has been out of vogue in pop rock since the late eighties, when it popped up in song’s like Glen Frey’s “You Belong to the City,” Men at Work’s “Who Can it Be Now?”, and Duran Duran’s “Rio.” What the sax in these songs have in common with “Midnight City” is warm, sensuous vibe. However, there is also sax on Echoes, and with a few exceptions, it’s more blurting, harsh, and surprising. Songs like Olio and I Need Your Love seem like the perfect soundtrack for driving into a city at night, preparing for a night on the town. Particularly, the sax in I Need Your Love seems to mimic the sounds and bleets of the highway while going through a concrete underpass, with lights rhythmically shooting by the window. Revisting Echoes also brought up some memories about live performances, if you would permit me a quick aside. My brother has a pretty good criteria when deciding whether to go see a band live, namely, “Will they put on a good show?” So, while a band like Godspeed! You Black Emperor plays great music, I found myself dragging when I saw them live last April. I’ve seen the Rapture live three times: 1) as an opening act for the Black Rebel Motorcycle Club, 2) as part of the very, very short lived Curiosa Festival (which featured a stellar lineup of the Cure, Interpol, Muse, Mogwai), and 3) and finally at a smallish gay bar in Philly. It was at this last show that the Rapture really slayed it. The attitude and the atmosphere of the entire crowd promoted excessive dancing, which felt completely liberating after being guilty of standing arms-folded, head-bobbing, at many a show. 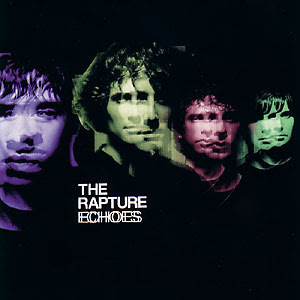 The music of The Rapture, and Echoes in particular seems designed to promote this communal, “Let’s have a good time!” Dance-rock seemed like it was going to be a big thing at the time, and experiencing the music in the correct venue with the correct audience made the show just plain dynamite. I am curious how The Rapture will sound going forward without the presence of bassist/co-singer Mattie Safir. His work on Sister Savior is especially prominent, anchoring the sound with a driving, nocturnal vibe. So, the next time you’re heading out on the town give Echoes a spin, will you? It really seems like it was written specifically for the times between 11 p.m. and 3 a.m, when the night is still open with possibility.